Segalas, J. 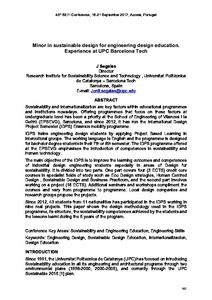 Minor in Sustainable Design for Engineering Education: Experience at UPC Barcelona Tech. A: Conference European Society for Engineering Education. "SEFI 2017: 48th Annual Conference: Azores, Portugal: September 18-21, 2017: proceedings book". Terceira - Açores: 2017, p. 162-167.